Ruby Tuesday - Animal Wonders Inc.
Ruby was found on a community yard sale website where her previous owner could no longer keep her due to complications in the family. She was well loved and only about 12 weeks old. She loves to play with her best friend Charlie and her fun loving personality is a perfect fit for our young son and other social animals. The most unique friendship she's established is with Chili Pepper the Patagonian Cavy. 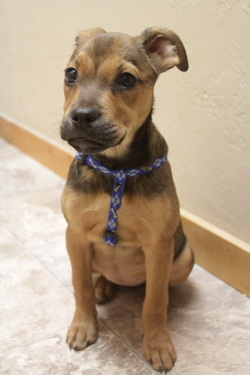 Ruby is a great puppy who is a good listener and wants to be friend with anything that moves. She couldn't be a better fit for living at Animal Wonders. We're so happy we are able to rescue amazing animals.